When the euphoric highs of teenage life in south London collide with his mum's terminal illness, all Rayleigh wants to do is watch anime in his pants and eat indomie. With Guyanese folk stories, grime, roti and raucous energy Big Foot is a funny and impassioned portrayal of becoming a man and the responsibility that comes with it. Black Theatre Live run with our digital thetare partners Pilot Theatre company. 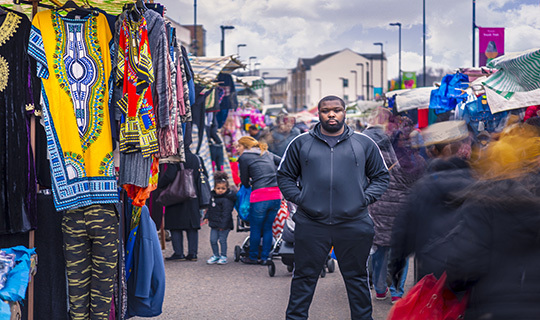 HIGHRISE THEATRE - Big Foot following seed commission support from BLACK THEATRE LIVE and STRATFORD CIRCUS ARTS CENTRE in 2016, we are delighted to confirm this show will be the next small-scale tour from the contortium in autumn 2017. Black Theatre Live is a pioneering national consortium of 8 regional theatres. Following Black Theatre Lives’ first tours in 2015 of Macbeth and She Called Me Mother starring Cathy Tyson and award winning The Diary of a Hounslow Girl and the UK's first all-black Hamlet in 2016, and An Evening With An Immigrant with Inua Ellams' in spring 2017 prior to his season at the National Theatre we are delighted to announce the next small-scale tour is Big Foot with HighRise theatre, set for autumn 2017.